These colorful take-home cards encourage preschoolers to respond with faith to the God who loves and cares for them. Order one set per child. Based on 36 stories from Genesis through Acts, Play leads you and the four- and five-year-olds in your Sunday school, home school, preschool, or daycare on a joyful discovery of God's love. 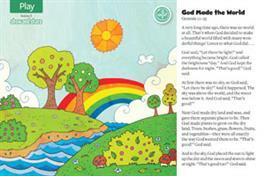 These colorful take-home cards encourage preschoolers to respond with faith to the God who loves and cares for them. The leader's resource kit (sold separately) includes 36 session plans, full-color leader's resources, a sample set of take-home story cards (for leader's use), reproducible pages, and a Sing With Me Preschool Songs CD with 22 kid-friendly songs.